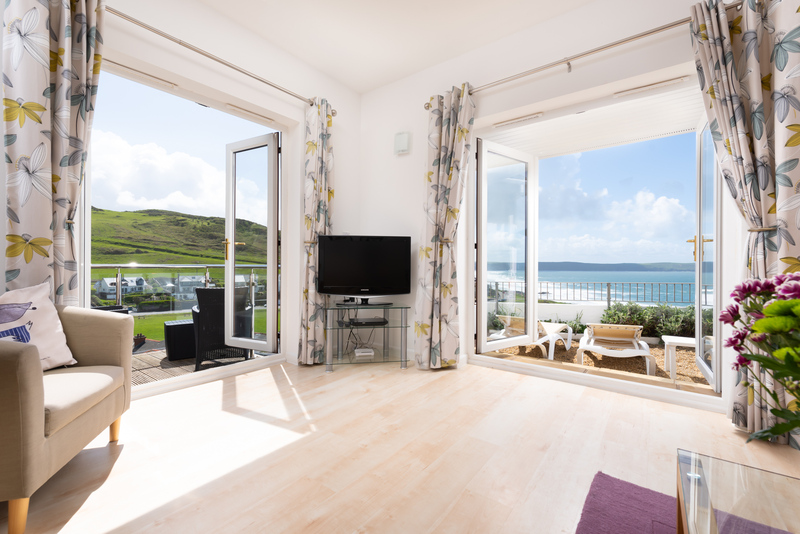 Sunnycliffe House is a bright spacious holiday home in Woolacombe with sea views, perfect for families and friends looking for a holiday by the beach. 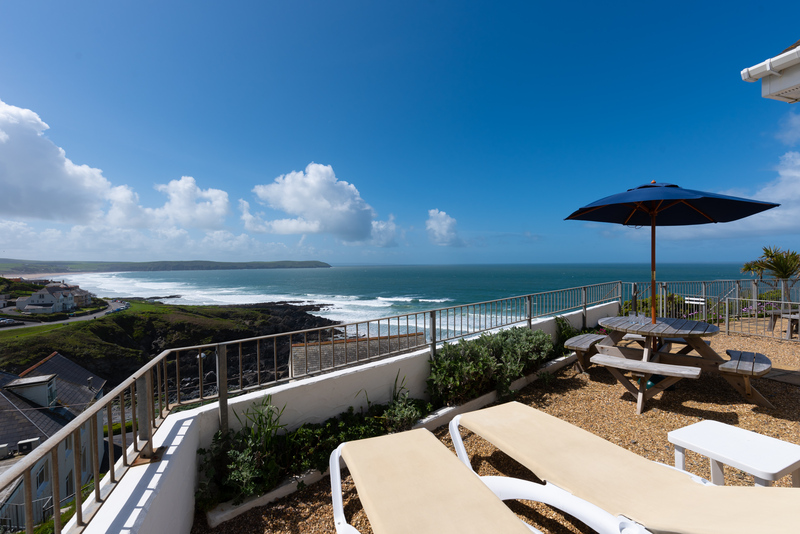 Set high on the cliffs between the North Devon villages of Woolacombe and Mortehoe, this Woolacombe holiday home overlooks the sea as far as Baggy Point, and directly overlooks Combesgate beach. This pretty secluded beach is only accessible between low and mid tide. It’s also not far from the smaller shingle beach, Barricane Beach, famous for the cowries and sea shells that wash up from the Caribbean and its beach cafe that serves amazing Sri-Lankan curries every night (from the Easter holidays) between 5pm to 7pm. 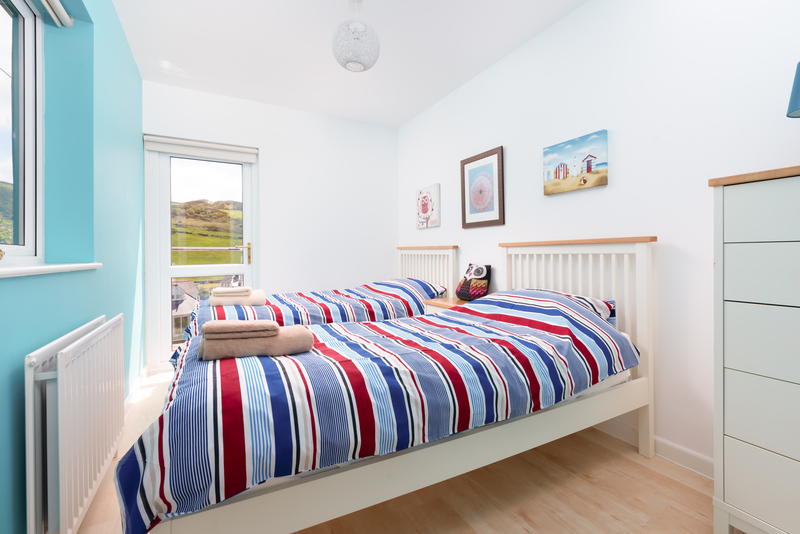 This Woolacombe beachside two storey holiday house, sleeps 6 in three well-presented bedrooms, all with lovely sea views. 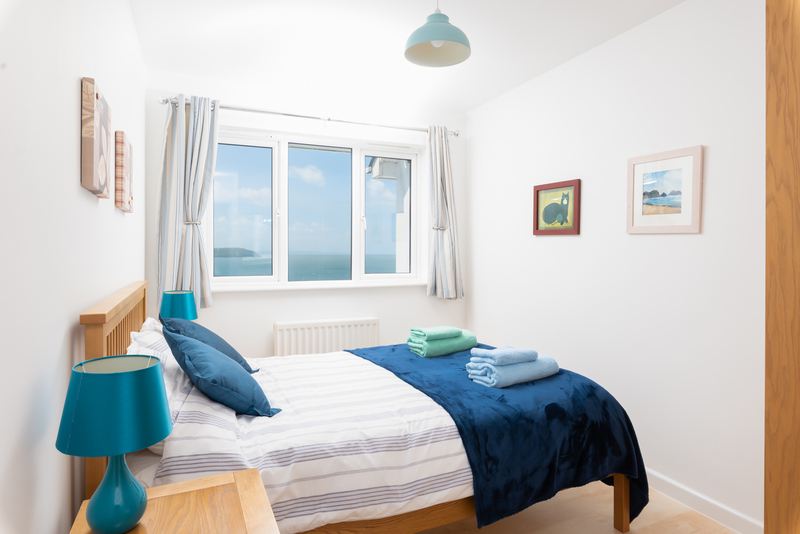 These include a twin bedroom featuring a small balcony with countryside and sea views, a master bedroom boasting a king-size bed and en-suite shower room and a double bedroom with double bed. 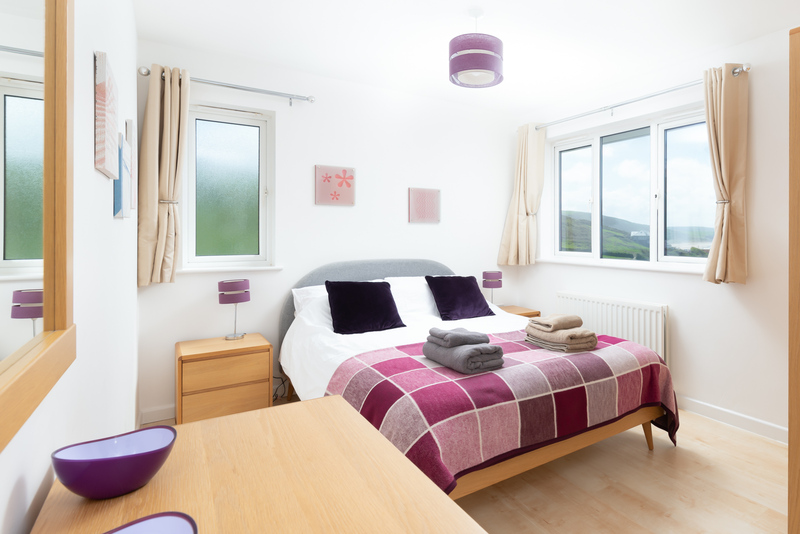 There is also an additional family bedroom with a bath and overhead shower, WC and wash basin. 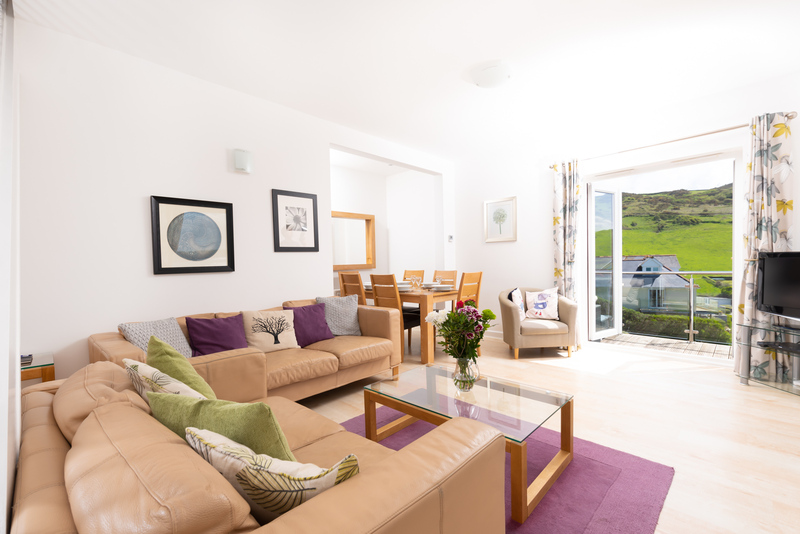 On the ground floor, an open plan living/dining space features two large sofas, a tub chair, bean bags for the kids, flat screen TV with a DVD player and a dining area comfortably seating up to six people. This space has two sets of French doors which open out from the living area to the terrace and balcony. 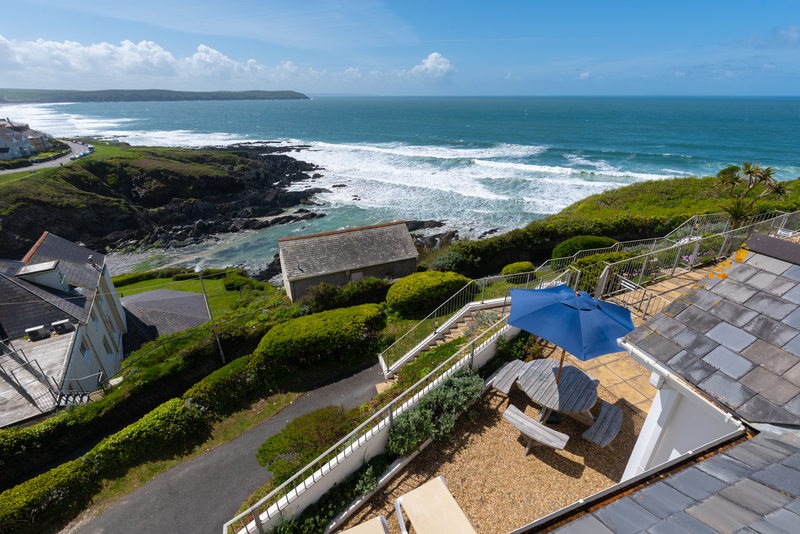 The first set lead to a fully enclosed south facing terrace, complete with a large picnic table and sun loungers and stunning sea views. A west facing balcony has a corner sofa, two additional chairs and a table enjoys uninterrupted sea views. Finally, a compact modern kitchen includes an electric oven and hob, a dishwasher, a microwave and a small dining time. 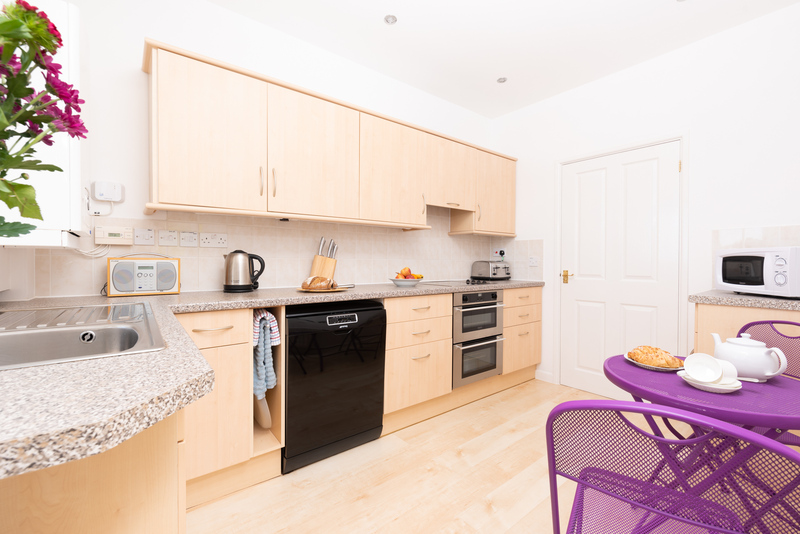 A separate utility room next to the kitchen has a washing machine, plus a WC and wash basin. The house has private parking for 2 cars accessed via a private driveway. 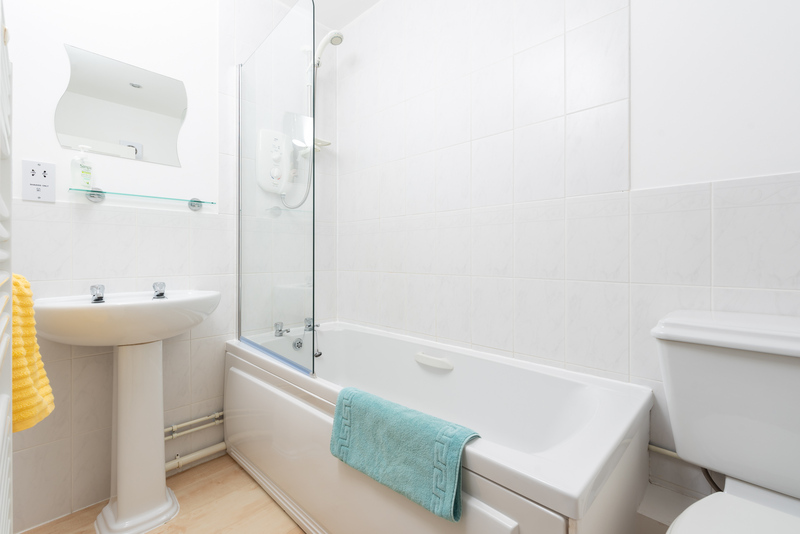 Utility room: Washing machine, plus WC and wash basin. Bedroom 1: Master bedroom - with king size and en-suite shower room. Bedroom 2: Double bedroom - with double bed and storage. Bedroom 3: Twin bedroom - with two full size single beds and small balcony. Family bathroom: Bath with shower overhead, wash basin and WC. Gas central heating, electric oven with hob, microwave, fridge/freezer, additional fridge, microwave, washing machine, dishwasher, WiFi, DAB digital radio, bed linen and towels provided (beach towels not provided), travel cot (please bring your own bedding), private enclosed terrace and balcony, short breaks available, 500m to the coast, 500m to nearest pub, off road parking for 2 cars, small garage, no smoking, weekly changeover is Saturday, pet free cottage, supermarket delivery. 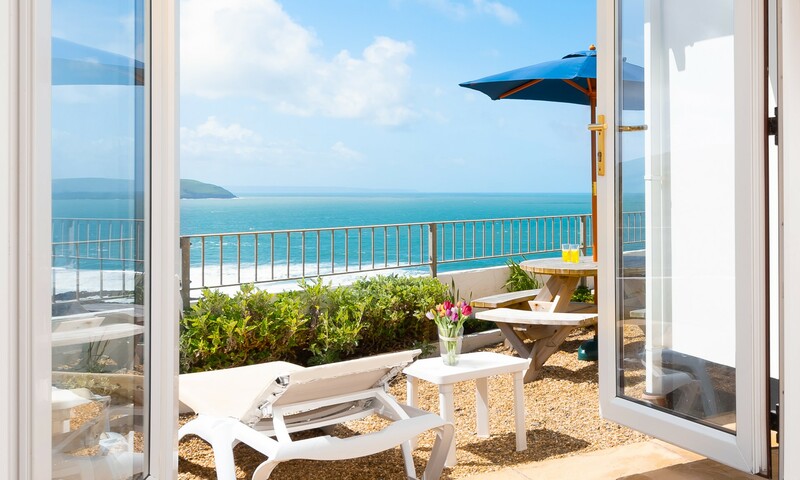 Just a short walk from Sunnycliffe is the lively village of Woolacombe which is full of great pubs, cafes, restaurants, shops and amusements. The 3 miles of golden, sandy beach can be accessed at Woolacombe, where you can also find surf hire shops to book a surf lesson or buy surf clothes. Combesgate beach and Barricane Beach are also just a short walk away. The charming cliff top village of Mortehoe is just up around the headland, and boasts three great pubs, a tea room and museum. A tractor ride from the museum to Morte Point is a lovely way to see if you can spot a ‘seal’ playing next to the shore. In the other direction beyond Baggy Point, the cool surf village of Croyde is home to lively pubs such as The Thatch and Billy Budds and a secluded beach with excellent surf for the more experienced surfers. For days away from the beach, the wilds of Exmoor is only a 30 minute drive away and local family attractions such as the Combe Martin Wildlife and Dinosaur Park, Exmoor Zoo and Watermouth Castle are all within easy reach.